• A dispute between citizens of different states with an amount in controversy that is more than $75,000. If your dispute does not fall into any of those four categories, you should not file your lawsuit in this court. Can the federal court overrule a decision by the state court? No. It is a common misconception among pro se litigants that federal courts can revisit and perhaps overturn a decision of the state courts. Only if a federal issue was part of a state court decision can the federal court review a decision by the state court. 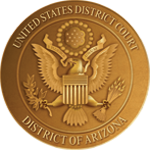 You file bankruptcy petitions with the United States Bankruptcy Court for the District of Arizona. Click here to go to its website’s page explaining how to file a bankruptcy petition without a lawyer. How do I file a complaint on my own behalf (Pro Se)? Please refer to the section labeled Handbook for Self-Represented Litigants for a complete explanation of the procedures. You may also call the Customer Service Department in Phoenix at (602) 322-7200 and in Tucson at (520) 205-4200 with further questions. If I decide to represent myself, are there basic things I need to know? There are many basic things that you will need to know to represent yourself. Reading the Handbook for Self-Represented Litigants is a good place to start. You can click on that title to access the handbook. May I represent someone else? No. Only a licensed attorney may represent another person or party. A pro se party is self-represented and may appear only on his or her own behalf. Can I represent my own corporation? No. A self-represented litigant may only represent him or herself. The law provides that a corporation may only appear in federal court through licensed counsel. How can the Clerk's Office help me? We are happy to help you if we can. However, we are allowed to help you only in certain ways, since we must be fair to everyone. Click here to see a list of some things the court staff can and cannot do for you. What do all of these strange legal words mean? You can view definitions of commonly used legal words by clicking here: United States Courts Glossary of Legal Terms. Also reference the Glossary in the Handbook for Self-Represented Litigants. Do I have to pay filing fees to bring a case? Yes. You have to pay $400 unless the court gives you permission to proceed without paying filing fees based on your financial condition. You can ask the court for permission by completing and filing an affidavit-of-indigency form. You can get the form from the Clerk’s Office or by clicking here: Application to Proceed Without Prepayment of Costs-Long Form AO 239. Can I pay for filing fees by check or credit card? Yes. You can pay filing fees with cash, a money order, a cashier’s check, or an in-person credit card. What if I can’t afford the filing fees? If you can’t afford the filing fee, you can ask the court for permission to proceed without paying it. To do so, you have to complete and file an affidavit-of-indigency form. You can get the form from the Clerk’s Office or by clicking here: Application to Proceed Without Prepayment of Costs-Long Form AO 239. Note that filing the form does not guarantee that you can proceed without paying the filing fee. The court makes that decision. Even if the court waives the filing fee, you will still be held responsible for other costs of litigation, including costs for service of process, photocopies, deposition transcripts, and costs and fees for witnesses. If your request to proceed without prepaying filing fees is denied, you have to pay the filing fees or the court will dismiss your case. Do special rules apply to employment discrimination cases? Yes. Before filing most employment-discrimination claims (age-discrimination claims excepted), a person must first follow administrative procedures or face dismissal. The law is complicated, and this is not a complete statement of the law, but, generally speaking, a person must first file charges with the Equal Employment Opportunity Commission or similar local or state agency and, following proceedings there, obtain a right-to-sue letter before proceeding to court. Is there a handbook or guide to assist me? Yes. It is the Handbook for Self-Represented Litigants. You can click on that title to access the handbook. Is there an alternative to representing myself that is affordable? Maybe. Some lawyers may accept your case for an agreed-upon percentage of recovery as their fee if you win and no fee if you do not. Chapter 2 of the Handbook for Self-Represented Litigants contains additional information on this subject. You may also wish to request a free consultation with an attorney by contacting the Federal Court Self-Service Center in Phoenix or Tucson. Are there any resources to help me find a lawyer? How do I draft a complaint? A complaint must be on 8 ½” x 11” paper, double-spaced, and either typed in a font no smaller than 13 point or written legibly in ink. It must include a caption, the basis for subject-matter jurisdiction, a short statement of the claim, a demand for the relief sought, and a signature block. Chapter 4 of the Handbook for Self-Represented Litigants has more information about each of those components. You can click on that title to access the handbook. The electronic complaint packets are produced using a question and answer interview process. At the end of the interview, the complaint and initial forms necessary are produced for you as a word processing document. Complaint forms are also provided on the Judiciary's website at http://www.uscourts.gov/forms/pro-se-forms. What do I need to file along with my complaint? With your complaint, you need to file a civil cover sheet. You can get a form civil cover sheet from the Clerk’s Office or by clicking here: Civil Cover Sheet Form JS 44. You also need to file a summons for each defendant. You can get a form summons from the Clerk’s Office or by clicking here: Summons/Civil Form AO 440. You also need to pay filing fees (with cash, a money order, a cashier’s check, or an in-person credit card) or request permission to proceed without paying them based on your financial condition. You can ask the court for permission by completing and filing an affidavit-of-indigency form. You can get the form from the Clerk’s Office or by clicking here: Application to Proceed Without Prepayment of Costs-Long Form AO 239.
Who is responsible for service of process? The person bringing the case is responsible for service of process. To understand what service of process is and how to effectuate it, read Federal Rule of Civil Procedure 4. The Handbook for Self-Represented Litigants has more information about service of process. You can click on that title to access the guide. How do I find a process server? You can find a private process server online or in the phonebook. The staff of the Clerk’s Office is prohibited from providing you with names of process servers. However, if the litigant is granted in forma pauperis status, the court will order the United States Marshal to conduct service of process. See Rule 4(c)(3), Fed. R. Civ. P. In addition, Rule 4(c)(2), Fed. R. Civ. P. allows any person who is at least 18 years old and not a party to the case to serve a summons and complaint. How do I serve the United States? Read Federal Rule of Civil Procedure 4(i) to learn how to serve the United States or any of its agencies, corporations, officers, or employees. How do I serve the Commissioner of the Social Security Administration? Read Federal Rule of Civil Procedure 4(i) to learn how to serve the Commissioner of the Social Security Administration and other government officers who must be served when you sue the Commissioner of the Social Security Administration. After I serve the complaint, what happens next? Once you have properly served the complaint, the defendant ordinarily must respond with an answer, a motion to dismiss, or a motion for summary judgment. If the defendant ignores a properly served complaint, you may pursue a motion for default and default judgment. Read Federal Rule of Civil Procedure 55 for information about default and default judgment. The Handbook for Self-Represented Litigants provides additional information about how a case proceeds through the court system after a complaint is filed. What are the rules for service of documents other than the Complaint? Rule 5 of the Federal Rules of Civil Procedure sets the rules for serving documents other than the original complaint. If the party you served has a lawyer, then you MUST serve that party’s lawyer. If the other party does not have a lawyer, you must serve the party. Rule 5 sets forth the various acceptable methods of service. Also reference Chapter 8 of the Handbook for Self-Represented Litigants. Can I speak directly to the judge or his/her staff about my case? No. You cannot speak to the judge or his or her staff without the other party (or the other party’s lawyer) present. Except for proceedings in open court, all of your communications with the judge should be in writing, filed with the Clerk’s Office, with copies sent to all parties or their lawyers. You should not send correspondence directly to any judge or to his or her chambers. A motion is simply a request to the court for some action. An example is a motion for an extension of time to file something. For additional information and requirements, you may reference Local Rule of Civil Procedure 7.2 and Chapter 12 of the Handbook for Self-Represented Litigants. How do I calculate time for filing documents? Please refer to Chapter 12 of the Handbook for Self-Represented Litigants, and to FRCivP 6. Is there a way to look up my case without going to the courthouse? Yes. If you have internet access, you can register for PACER (Public Access to Court Electronic Records) and view and print the documents for your case. To register, go to the PACER registration page on the PACER website (www.pacer.gov) or call (800) 676-6856. Using PACER may cost $.10 per printed page. PACER will give you details when you register. Where can I find rules and cases? Information on law libraries in court locations is available here. Where can I look at all of the documents filed in my case? The Clerk’s Office maintains a computer record for each lawsuit. It includes a docket, which is a chronological list of all court events and documents filed in a case. You may view the docket at public-access terminals in our Clerk’s Offices. Documents printed from a public-access terminal in a Clerk’s Office cost $.10 per page. Copies of any document made by the Clerk’s Office staff cost $.50 per page. The Clerk’s Office staff may provide basic docket information, in person or over the phone, but may charge a fee of $30 for a records search. If you have internet access, you may also register for PACER (Public Access to Court Electronic Records) and view and print the documents for your case. To register, go to the PACER registration page on the PACER website or call (800) 676-6856. Using PACER may cost $.10 per printed page. PACER will give you details when you register. Can I bring a cellphone, camera, laptop or tablet computer into the courtroom? Any form of capturing, recording, broadcasting, transmitting or photographing anything inside a courtroom is prohibited. Unless otherwise ordered by the Court, cellular phones are prohibited from use in the courtroom. Unrepresented parties may use laptop computers provided they emit no sound and are not disruptive to the proceedings. Additional details may be found in Local Rule of Civil Procedure 43.1. If I want to appeal a judge’s decision, what do I do? Generally speaking, you may only appeal a final order or final judgment that disposes of the case. (There are exceptions for interlocutory appeals, but those are rare.) It is important to first read the rules and determine if you have a right to an appeal. If you don’t have a right to an appeal and file one anyway, it may delay proceedings in your lawsuit. You may also wish to reference Chapter 21 of the Handbook for Self-Represented Litigants. If you do have a right to an appeal, you must timely file a notice of appeal in the district court. The number of days you have to file an appeal after a judgment varies, so you must consult Federal Rule of Appellate Procedure 4. The appellate court over the District of Arizona is the United States Court of Appeals for the Ninth Circuit.